The Sacred Writings, Book 2 in the Beneath the Blackberry Moon series by April Gardner, is possibly my favourite of the trilogy – which is actually saying something since the entire series has completely captivated me. The central character in this book is Totka, the Red Stick brave we met in Book 1, told almost entirely from his point of view. It sheds some important light on the man he is on the inside and the past experiences that shaped him to be the noble hero from the first book, The Red Feather. One of the most impressive things about the novel is the authenticity and respect with which the author treats the First Nation culture. It is clear she has done her research, but the events and customs are so intertwined as to never sound expository. Instead, a vibrant history comes alive – a tale of a noble people whose seeming ‘savagery’, when put into perspective, is quite natural and just. Having read Books 1 and 3 before reading this one, I was thrilled to be reintroduced to this character, his family, his culture, and his strong conviction. Bravo to the author for creating such a substantive and meaningful story. I look forward to more in the saga. Beneath the Blackberry Moon Part 2: the Sacred Writings, written by April W. Gardner, is the second book I’ve read by this author and just as exciting as the first of this series. I can honestly say, I’m not a crier…I don’t usually cry while reading my books…BUT this one I was totally crying over! Part 2 has a lot of information in it…take you places in the beginning of the book that aren’t expected and yet needed for the completion of the book…so stick with it. Then in the middle of the book the emotions are full blown. Gardner takes the passion and emotions and just fills each page. I love her ability to intermix history and fiction and the way that she places Jesus as the main reason for this book. Oh…it’s a page turner! If you’re into passion, true deep love, native American history and biblical foundations…this book is for you! !I was gifted this book in exchange for my honest review. Full review on Faithfully Bookish http://www.faithfullybookish.com/revi...What most resonated with me is the respectful and thoughtful attention to detail in regards to the Muscogee culture and customs. From stickball to family structure to spiritual beliefs and everything in between, the whole package provided a sense of complete immersion in an unfamiliar way of life and turbulent time.Totka is a warrior, leader, and beloved brother. He is respected, witty, passionate, loyal, and robust. Unfortunately, nothing in Totka’s life is turning out how he expects and it seems the only thing around each bend is another twist or turn in his path. I highly recommend this saga, it has a special place in my reader heart.I received a copy of this book from the author. The opinions expressed are my own. This is wonderful story, that I greatly enjoyed! Rich in historical details, with plenty of emotion, smiles and tears. The characters make you feel like your there with them experiencing their joys and sorrows. If you've read Beneath the Blackberry Moon Part 1: the Red Feather, I would definitely recommend you read this book as well!I received this book from the author in exchange for my honest opinion, which was given. I cheered for Adela as she waits for hersoul mate to return to her. In the meantimehe is searching the Scriptures to see ifhis woman's God is real. Throughcircumstances they are not aware ofthey are separated and long for eachother, to marry and have a family.Will they find each other again?Read the book to find out. Emotional charged, this historical romance is very well done! So many twists and elements to this book!Wow! Just when I figured I had this book figured out, there was a new twist. A great book that will not leave you disappointed! I loved The Sacred Writings! This is the sequel to The Red Feather which picks up exactly where we left off. This time we don’t see an actual historical event because this is Totka’s journey to finding faith in Jesus Christ. The Muskogee culture is so different from ours so it focuses on cultural immersion more than it does history. Gardner does a beautiful job of portraying the people in a respectful and honorable way.Once again, I felt as if I were truly there with the characters and observing all that was happening. I feel like I can truly understand Totka better and where his people are coming from. I loved getting to visit Totka, Leaping Waters, Little Warrior, Singing Grass, White Stone, Lachlan and so many more of the characters again. Of course, we also meet new and exciting characters as well.The Creek Wars are over so we get to observe as everyone puts their lives together again. Everyone has been affected and there is so much distrust and prejudice. Will the different people groups learn how to live each other or will things just go downhill.April’s details come to life. From stickball tournaments to betrayal brought learning how Totka injured his knee, it has it all. This story is unique and rich.April strings the romance along, but I’m glad she did because it was necessary.It also has all of the feels! You’ll laugh, cry, cheer. It has all of it. I felt Totka’s confusion and grief. I cried like a baby during certain events that happened. With that being said, make sure you have tissues handy.This is a beautiful series that everyone needs to read. There is talk about spreading the faith about Jesus, compassion, forgiveness, and learning to overcome anger and bitterness.Looking forward to reading the rest of this series. I NEED MORE!Highly recommended!Disclaimer: I received a copy of this book from the publisher for my honest review, which I have given. I was not required to write a positive review and have not been compensated for it in any way. All opinions expressed are my own. This one is very very good and tells the story of Totka more fully. Further into the book, I did start to lose interest as I had just read the first book and it was beginning to feel a little to "enduring" and "saga-esque." I just wanted the characters to have their happily after already. Sadly, even at the end of this book we still don't see the main characters have full resolution. I still enjoy the writing immensely, just needed a little break since "every thing that can go wrong", does. Great readingI am excited to read the next book in this series! This is the best reading I've had in a long while! 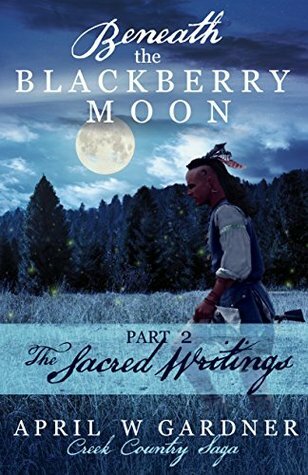 Beneath the Blackberry Moon Part 2: the Sacred Writings takes us back to the beginning before the battle between the Colony and the Indians. We find out why there was such turmoil and hard feelings between family members. Matters of the heart becomes a battle of strife. Romance, native American history and biblical foundations make this a story that will keep you turning the pages, the characters and events are so captivating! Loving this series! I was gifted a copy by the author. This is a wonderful novel. I enjoyed getting to know more about the characters and watch them share their struggles and heartache. I laughed and cried and am now searching for the next book in this series. I received a copy from the author for an honest review. I happily give this book 5 stars. I was so afraid to start reading this book; afraid that it wouldn't live up to the first. I have read many other novels where the main characters split off from each other in the second book and I have never liked that second book until now. Though very different from the first part, The Sacred Writings is just as amazing and I'm a little thunderstruck by how much I enjoyed it.What sets The Sacred Writings apart from other stories where the love interests are separated is that the majority of this story focuses only on Totka. April made the correct decision to let him hold the story since his is by far the most interesting plot line at this point in his and Copper Woman's story. And even though he and Copper Woman are not together, she is never far from his thoughts and I love how their separation drove his character arc.Though the romance is not quite as strong, there are enough scenes to keep the romantic tension going right along side every other conflict Totka has to deal with. *Hugs book to chest* I loved this book so much.That is not to say that there are not a few problems. A couple scenes stretched on longer than I was willing to read through and I ended up skipping on to the next. As well, the very last connection found between Totka and Hilaho felt like far too much of a coincidence. However, if you loved the first part, you will adore this as well.